AUVs. Despite their small size, they are capable of diving to 500 m (2500m for ecoSUB-m25) and have suf? cient battery power to stay underwater for several hours. 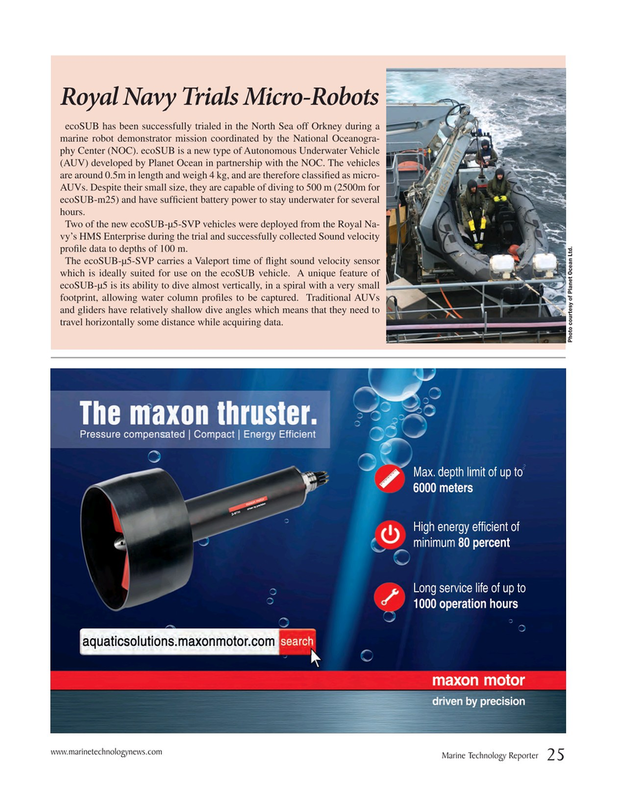 Two of the new ecoSUB-µ5-SVP vehicles were deployed from the Royal Na- vy’s HMS Enterprise during the trial and successfully collected Sound velocity pro? le data to depths of 100 m.
The ecoSUB-µ5-SVP carries a Valeport time of ? ight sound velocity sensor which is ideally suited for use on the ecoSUB vehicle. A unique feature of ecoSUB-µ5 is its ability to dive almost vertically, in a spiral with a very small footprint, allowing water column pro? les to be captured. Traditional AUVs and gliders have relatively shallow dive angles which means that they need to travel horizontally some distance while acquiring data.